Follow crowdfunding long enough and you start to see common mistakes among campaigns that fail to reach their crowdfunding goal. Researching other campaigns and common crowdfunding mistakes is a big part of making your own campaign a success. Make sure you aren’t making some of the biggest crowdfunding mistakes in your campaign by avoiding these five major mistakes. Eric and Morne wanted to raise $7,000 to help pay Eric’s parents to attend their destination wedding in South Africa. Why not pay Eric’s parents themselves…they would but the rest of the wedding was getting a little expensive. That’s not surprising considering the couple was planning events in three destinations (South Africa, Houston and London) so all their friends could celebrate the marriage. The public outcry got pretty fierce and the campaign was canceled, even though it had raised over $3,600 toward its goal. I see this crowdfunding mistake a lot, especially on the charity-based crowdfunding platforms like GoFundMe. The problem is not asking the crowd to help you pay for something. The problem is with HOW you ask. Charity crowdfunding, where backers do not receive anything in return, should be reserved for the benefit of someone else. Paying for a mission trip or other plans for one person is fine but you have to be able to show benefits across a larger group of people. For campaigns that will benefit one or only a few people, you need to offer some kind of reward system. Anything related to the campaign will work. The campaign above could have offered souvenirs from South Africa, drink tickets for one of the planned events or even a walking-tour video of the city in South Africa. When the Ministry of Supply launched its Kickstarter campaign to raise money for its patented line of business wear, the team knew they had something good. They just didn’t know how good. The $30,000 campaign goal was smashed, raising more than $429,000 in a month and the company found itself needing to produce 10-times the rewards they had anticipated. The gap in production and distribution capacity threatened to devastate the company’s name it had worked so hard to build. Not preparing for what happens after the crowdfunding campaign is one of the biggest mistakes I see with successful campaigns. Don’t let all your hard work go to waste by not being prepared. Fortunately, the Ministry of Supply was able to reach out to their backers and explain what would be a lengthy delay in rewards fulfillment. Their community was mostly receptive to the apology but it could have been avoided by planning for different crowdfunding scenarios. Know what you will do if your crowdfunding campaign goes viral. You don’t have to make a formal contract with large-scale manufacturers but check out a few to see at what capacity they can produce, at what cost and how quickly they can make it happen if needed. Having a plan in place before you need it can help to avoid a dream campaign from turning into a nightmare. This isn’t about the all-or-nothing funding model on crowdfunding sites like Kickstarter but about thinking you need to crowdfund your entire need all at once. More than 70% of the campaigns on Kickstarter raise less than $10,000 and just 2% of campaigns raise more than $100k. I have seen some really great projects fail simply because their fundraising goal was just too high. Worse still is the fact that many campaigns raise a sizeable amount, even in the tens of thousands, but get nothing because they didn’t meet the funding goal. A crowdfunding goal of $10,000 or less may not be enough to take your idea national but it may be enough for a specific project or expansion. Crowdfunding is most effective when it is for a specific and well-defined purpose. Don’t think you need to crowdfund your entire operational budget. Take a page from traditional finance and crowdfund your company in stages, starting with seed financing to develop the idea and then moving on to other rounds of financing. You only need a basic working product for a reward. Later, you can crowdfund the development of extra features on your product or project, or the expansion to a new group of customers. This is, by far, the biggest crowdfunding mistake I see in campaigns. It’s also the most frequently seen mistake. Crowdfunders fail to understand the process involved in crowdfunding and the need to build excitement and a community before the campaign. Besides the lack of building up to the campaign, there is just not enough time during a campaign to do the outreach necessary for success. Of course, the result is the fact that more than 60% of campaigns fail to reach their crowdfunding goal. Plan on at least a month of pre-launch crowdfunding before your campaign to build your community. This is going to do two things for the project. First, it will get more people onboard and increase support. The standard month or two that a campaign is live just isn’t enough time to get your message out to everyone. Pre-launching your campaign is also going to take some of the burden off your shoulders when the campaign is live. Having a community of interested backers already established means you won’t have to spend hours on social media sharing your message to the masses, your community will do it for you. Check out this guide to crowdfunding pre-launch steps with contributions from 10 crowdfunding experts and more than 30 tips on pre-launch crowdfunding. Sarah Mensah and Copertura label found out the hard way that massive traffic to a crowdfunding platform doesn’t do you any good if the platform isn’t right for your campaign. The Heated Vest crowdfunding campaign was originally launched on Kickstarter to raise money for production of the inner & outer wear product. The campaign failed to meet the $12,000 goal because, at the time, Kickstarter did not have a good system for international pledging. Since the company is based in Germany, a large part of the community around the brand was in Europe and internationally. After pulling the plug on the Kickstarter campaign, the project was moved to Indiegogo where it would be easier to reach and get pledges from an international audience. While Kickstarter may have solved its problems with international campaigns, it and the larger platforms may still not be the best for your campaign. It doesn’t matter that the popular platforms get millions of visitors a month if those visitors are not interested in your campaign. I’ve put together a review of 18 crowdfunding and fundraising websites with the unique features on each and an index to make it easier to find the perfect platform for your campaign. Artists, writers and others that regularly create new works may want to check out Patreon which allows people to make a recurring pledge for each new work. 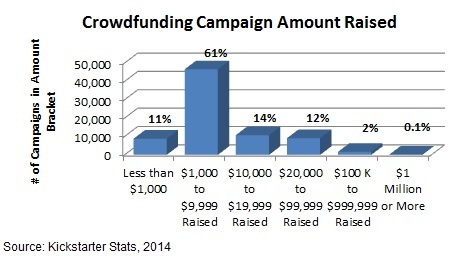 Equity crowdfunding campaigns generally raise much more money than rewards-based. Small business owners willing to share their profits should consider one of the equity platforms. Don’t believe me when I say, “You can crowdfund anything?” Check out seven of the most Ridiculous Crowdfunding Campaigns on The Penny Hoarder Blog – five of which actually met their fundraising goals! In crowdfunding, it’s not what you ask for but how you ask it. Avoid the biggest crowdfunding mistakes and you’ll be on your way.